This website has apparently been around for many years, but I just found it. 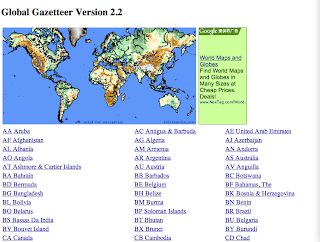 It is a FREE ONLINE GLOBAL GAZETTEER by a company named Falling Rain Genomics, Inc. and looks like it could be very handy. There are links for Greece, Cyprus and Turkey. Here is a screen shot of Greece. Listed are all the Regions of Greece, for example, I clicked on Nomos Lakonias. In Lakonias it then displays "Place Names" along with the Latitude, Longitude, Elevation (feet), and Population. From this list I picked Sparti. The top portion of the page for Sparti is shown below. What I found to be very helpful is that under the main title of the page there is a section titled "Other names": and it lists a variety of spellings for this particular location i.e. Sparte, Sparta, Lacedaemon, Spartē, Spárti, Lakedaimon, Lakedaímon. As usual, good luck with your Greek family history genealogy research. According to the FamilySearch.org wiki on Greek genealogy research - "The recruiting records are particularly valuable as they include a register of all males by year of birth." They suggest that you will have to write to the recruiting office of the Ministry of Defense main office for information as to the location of these records in the local archives. Now you can get the mailing address and email address for each local recruiting office ONLINE. 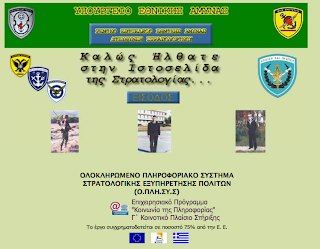 Click on ΕΙΣΟΔΟΣ (Enter) on the main screen. The following screen will appear. In the left column click on ΕΠΙΚΟΙΝΩΝΙΑ (Contact). You can then click on the appropriate area of Greece to get the local Recruitment Office information. 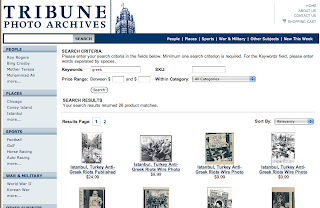 Here is a list of 12 new links that are on HellenicGenealogyGeek.com -- You can view all the links on the page titled "Links that are new and have not been categorized yet"
Cyprus Action Network of America (CANA) - Free download of the Greek and English PDF book "BLOODY TRUTH"
Hellenic Institute of Byzantine and Post-Byzantine studies in Venice - "The aim of this web site is to present, in summary form, the history of Hellenism in enice, and more specifically of the Greek Orthodox Community, founded in 1498. Note: The Digital Presentation link will allow you to view many books & manuscripts (scanned in total) and miniature paintings (many icons). There are 855 names (including some possible Greek names born in Turkish territory). "The electronic era enters the Hellenic Parliamentary Library. Through the http://catalog.parliament.gr portal visitors now have on-line access to a wealth of information from its catalogues, beginning with 3,000 19th and 20th century (up to 1940) - Greek and foreign newspapers and magazines, as well as over 3,000 rare manuscripts and publications. The scanning process is being carried out in the framework of the "Information Society Programme (as part of the Third Community Support Framework) in the Library's digital section." To view the search page in English - click on "Library of the Hellenic Parliament" words in English in the upper right hand corner. The Chicago Tribune is in the process of digitizing 130 years of photographs. Out of the photos they have processed to date I found a group titled "Istanbul Anti-Greek Riots"